Software Maintainability: 75% of Your Budget Is Dedicated to Software Maintenance. Software maintainability is defined as the degree to which an application is understood, repaired, or enhanced. Software maintainability is important because it is approximately 75% of the cost related to a project! How many resources are you dedicating to supporting code that could be deleted or improved? Finding ways to measure this important factor eases developer effort, decreases costs, and frees up resources. Understanding software maintainability allows organizations to identify improvement areas as well as determine the value supplied by current applications or during development changes. Resource needs continue to grow as environments become increasingly complex and applications are rapidly developed. Software maintainability metrics deliver an inexpensive, accurate approach to detecting potential causes of unmaintainable systems. As a result, your organization obtains insight into improvement areas and can monitor critical systems throughout its application life cycle. A software maintainability measurement is a rating used to assess the amount of effort or resources currently committed to an application. Automated solutions offer an accurate, objective way to measure each program. They supply a benchmarking measurement for reducing application complexity, improving quality, and mitigating risk as an application is created, enhanced, or maintained. Automated analysis is a viable, cost-effective approach to identifying software maintainability issues and determining what actions should be taken to reduce programming efforts or costs. 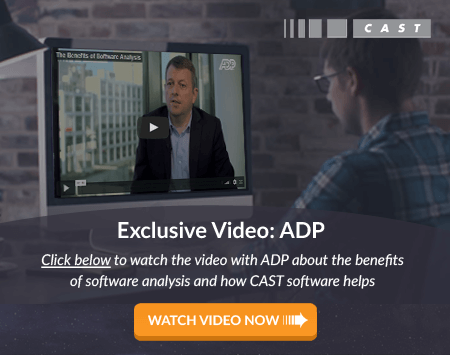 CAST Application Intelligence Platform or AIP is an automated analysis solution designed for enterprise use in complex, multi-tier infrastructures. It has the capability to assess multiple languages based on the number of functions required by a new program or enhancement. AIP may be used at any point in the development life cycle to identify software maintainability issues. It provides the information your organization needs to alleviate problems caused by insufficient or defective code within an application. Click here to learn more about the benefits of performing static analysis with AIP and how it can help minimize software maintainability costs for your organization.